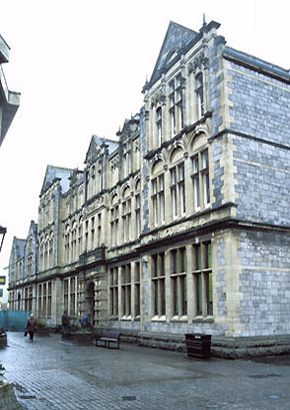 Stephen Tucker of SMT Associates was the project manager of a three year programme of external and internal repairs to Truro Library. Having been appointed he had to oversee and liaise with all of the specialist contractors that were required to make the project a complete success. It should be noted that this was a particularly sensitive project due to the location and importance of the building. 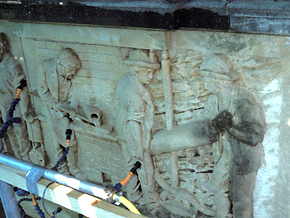 The external works involved cleaning, repairs and replacement of the ashlar limestone facades, consolidation of fragile Bathstone sculptures and pointing and plastering with lime mortars. The internal works included repairs to the decorative ceilings, mosaic floors, decorations and the installation of a wireless fire alarm system. Trial cleaning was undertaken and the results analysed over an 18 month period. It was decided that the most effective method was to clean the whole limestone areas with intermittent fine nebulous sprays. Thick areas of soiling and the sulphate skin, were treated with poultices prior to spraying. 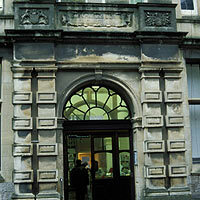 The sculptues were consolidated by lime watering, repaired with lime mortar and protected with shelter coats. 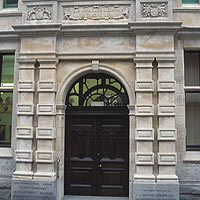 The trial areas showed the results to be expected from the cleaning processes. Probes were used to monitor the walls and no significant rise in wall moisture content was recorded during the works. The mixes for re-pointing and plastering were designed after analysis of the original mortars using acid disolution and thin section analysis techniques. Paint analysis revealed the windows, doors and rainwater goods were originally green. In consultation with the Conservation Officer and reference to historic paint colours it was decided to reinstate the original colour system, which has proved to be the most controversial part of the project. 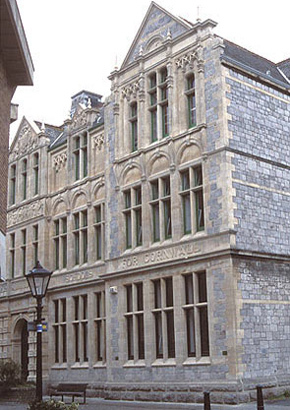 Its fair to say though that the repairs and restoration were a real success and the library is a building that the City of Truro can rightly be proud of.